The WD wagon continues to roll, bringing back the sounds of London's streets circa 1992 in all it's gritty glory! This, the latest instalment of reissues, reworks and rediscoveries see's a rare EP featuring cuts from a clutch of artists from the stable including No Smoke, Addis Posse & Gary A'Gaye. 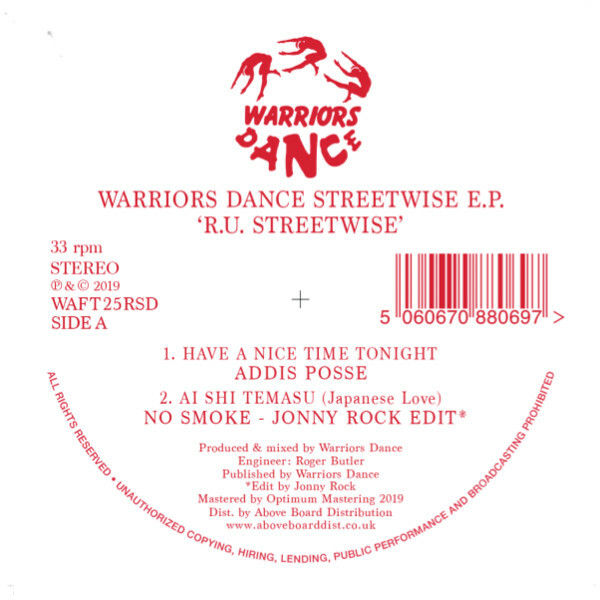 As ever, the Warriors sound is a stew of Dub, Hip-Hop breaks, House, Techno and synth sounds all collaged together using minimal gear and the UK warehouse and sound-system mentality. A heady mixture, you might say. Across 4 tracks we are treated to the ruffness, a handful of club ready bombs that will still do the damage right now in the 2019. As a special Record Store Day treat the mighty Jonny Rock has been drafted in via satellite to give us his extended, narcotic re-rub of No Smoke's killer 'Ai Shi Temasu (Japanese Love)' turning it into a winding, after hours DJ tool that will skilfully snake it's way through the dance at silly o'clock at any rave. Pure joy. OG pressings of this EP are sought after, expensive and rarely turn up. Now you can own this seminal piece of UK street music with a 2019 twist, in all the right ways!